AdventHealth North Pinellas will be able to perform complex, minimally invasive surgeries using the state-of-the-art da Vinci ® Xi robot. AdventHealth North Pinellas Care Team cuts the ribbon on their da Vinci Xi surgical robot. 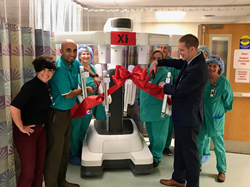 AdventHealth North Pinellas is the latest hospital in the West Florida Division to integrate the innovative da Vinci® Xi robot into the operating room. Surgeons trained on the da Vinci systems can view the surgical site using magnified 3D HD technology, allowing them to make more precise adjustments during colon, cardiology, bariatric and gynecological procedures, just to name a few. Robotic surgeries mean less blood loss, less pain, less risk of infection, minimal scarring, and a quicker recovery for patients. AdventHealth North Pinellas will use the da Vinci® Xi to perform general, urology, colorectal and thoracic surgeries. AdventHealth North Pinellas Surgeon Dr. Raj Kotak was the first to use the robot on January 3 during a successful gallbladder surgery. AdventHealth is committed to investing in the most advanced technology and innovation to provide exceptional, whole-person care to every patient, every time. The West Florida Division of AdventHealth has some of the nation’s brightest medical minds making lifesaving breakthroughs in the Greater Tampa Bay region. We are surgical pioneers, scientists and researchers with leading edge technology and innovation for the best medical experts to deliver our brand of inspired, compassionate care to every patient, every time. Our network of care includes AdventHealth Carrollwood, AdventHealth Dade City, AdventHealth Lake Placid, AdventHealth North Pinellas, AdventHealth Ocala, AdventHealth Sebring, AdventHealth Tampa, AdventHealth Wauchula, AdventHealth Wesley Chapel and AdventHealth Zephyrhills, as well as three freestanding offsite Emergency Rooms including AdventHealth Central Pasco ER, AdventHealth Palm Harbor ER and AdventHealth TimberRidge ER. We also have post-acute care, physician groups, Express Care at Walgreens clinics, urgent care centers and home health care. As part of AdventHealth, a faith-based not-for-profit health care system, our mission, Extending the Healing Ministry of Christ, is at the center of everything we do. AdventHealth has hundreds of care sites and nearly 50 hospitals across the United States, dedicated to treating body, mind and spirit and delivering whole-person care to our communities. For more information about AdventHealth, visit AdventHealth.com, or Facebook.com/AdventHealth, and for specific details on the West Florida Division of AdventHealth, click here. AdventHealth North Pinellas, located in Tarpon Springs, is a 168-bed, full-service hospital specializing in cardiovascular medicine, emergency medicine, orthopedics, wound healing, sleep medicine, women’s care, and general surgery including minimally invasive and robotic-assisted procedures. AdventHealth North Pinellas has been nationally recognized by the American Heart Association, the American Stroke Association, The Joint Commission, and The Leapfrog Group, for excellence in providing quality patient care. AdventHealth North Pinellas serves both the Pinellas and Pasco communities of West Central Florida. For more information, visit http://www.AdventHealthNorthPinellas.com.